Description: this four legged rhino like dinosaur is easily recognizable by its large head with the round crest around it and three horns on its face, two large ones above the eyes, and a smaller one on the snout. It has a beak resembling a parrot's. The crest is adorned with small black spikes sticking out of it (16 in total). It has a sturdy body, about twice the length of the head, ending in a short thick tail. Very noticeable, this figure sports a dino damage wound on its left flank, showing white ribs and red muscle tissue. A small button can be found in this wound, which when pressed produces a low howling growl. A second sound can be made by pushing the tail upwards, which also causes the head to rise upwards, as if attacking something with its horns. This second sound is more aggressive, like a hissing growl. This Triceratops has a rather dark paint job. Its body is mostly coloured grey, covered with thick dark grey spots and stripes on its back, legs and tip of the tail. Its underside (throat, belly and lower part of the tail) is painted bright beige. Its head is coloured in a much lighter shade of grey, except for most of the lower jaw section, the areas around the horns, and the outer most parts of the crest, which are also coloured in a darker grey. The creature has small red eyes in dark grey eye sockets, while the horns and beak are light beige. The figure has a pink tongue, but the inside of the mouth isn't painted. White JP logos are located on both upper hind legs. The Velociraptor stands in a stalking pose, its right arm and leg stretched outward and its head raised upwards with its mouth open, as if it means to jump on something. The tail is raised upwards and bent at the tip. Its underside (throat, belly and front half of the lower tail) is painted white, while the rest of the body sports an orange paint job, except for a thick dark red stripe running from the snout over the head, neck and back to about half way the tail. On either side of the figure, three smaller red stripes run out of the main red colouring over the flanks. The hands are also painted in this red colouring. The figure has white teeth, a very light pink tongue and inside of the mouth, cat like yellow eyes with black pupils and black JP logos on both upper legs. Analysis: if a repaint is ever long over due, that would be the case for this particular sculpt. Triceratops is one of the most famous dinosaurs ever, yet the JP III Triceratops sculpt has been oddly neglected in the previous repaint lines, which is all the more shocking considering this is one of Hasbro's most accurate and appealing sculpts. JPD3 finally corrects this mistake and gives the figure a decent new paint job, kinda reminiscent of a rhinoceros, which would already be the first contemporary animal this creature would be compared with. The new paint scheme is not overly imaginative or exciting, but suits the beastie pretty well. It could have used more details on the crest, as well as painted horns, but it's a fine paint job as it is. Otherwise this figure remains the same: predictable but adequate head butting action, some nice dinosaur sounds and the typical uncoverable dino damage wound. The Micro Raptor is of less interest, mostly because we've seen this sculpt all too often already and it's still boring. It also lacks details, most notably the claws. The only possible redemption this figure offers is the overall paint and colour scheme, which is remarkably similar to the scheme seen on the classic JPS1 Electronic Velociraptor figure. It may not have been done deliberately (knowing Hasbro that seems unlikely), but it does give a little shock of recognition to older JP toy fans who fondly remember that particular Raptor figure. Were it not for this particular point of interest, this paint job would rank right up there with the most forgetful Hasbro paint jobs in existence. By the way, the Triceratops would either trample or skewer the Raptor to death in a fight between the two. The Raptor better ignore this herbivore if it knows what's best for it. Repaint: yes. 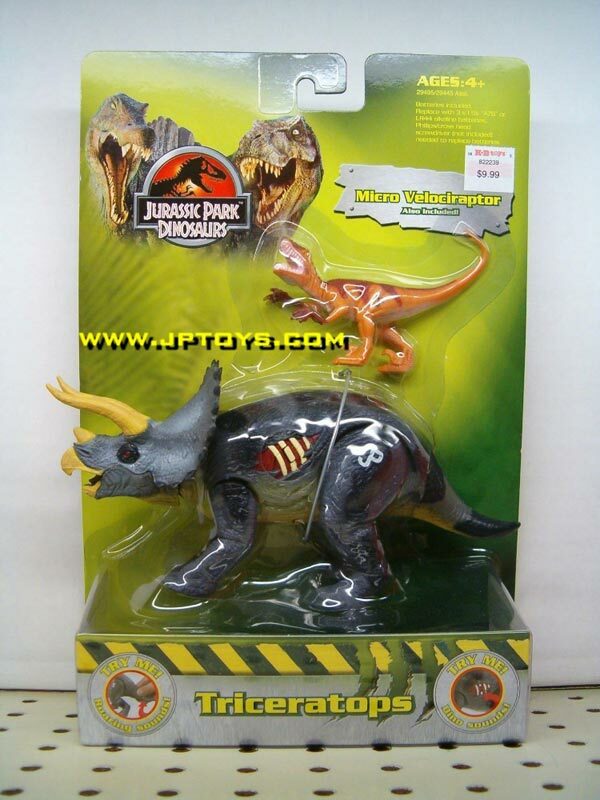 The Triceratops is a repaint of the JP III Triceratops sculpt. The Micro Raptor originally came with the JP III Alan Grant figure. The Triceratops is a first time repaint, and would be repainted again for JP 2009. The little Raptor has been used for Camo-Xtreme and JPD2, one other set in this line, and would also be used for JP 2009, making it one of the most often repainted Hasbro sculpts. Overall rating: 7/10. The Triceratops is a fine repaint of one of Hasbro's more successful sculpts. The Raptor is nothing special, though its paint job could be seen as an homage to JPS1. Like the other JPD2/3 electronic dinosaur figures, this two-pack was very common a few years ago, but has since become harder to find, though this set is probably the easiest to find of the six JPD2/3 electronic/micro two-packs. If you want one, you might need to practice patience a bit, but it shouldn't require much money once you've found it.